(Winner of the Francis Parkman Prize and the Zócalo Book Prize and a finalist for the 2015 PEN/John Kenneth Galbraith Award) In just 1,337 words, the Declaration of Independence altered the course of history. Troubled by the fact that so few Americans actually know what it says, political philosopher Danielle Allen set out to explore the arguments of the Declaration, reading it with her University of Chicago students. 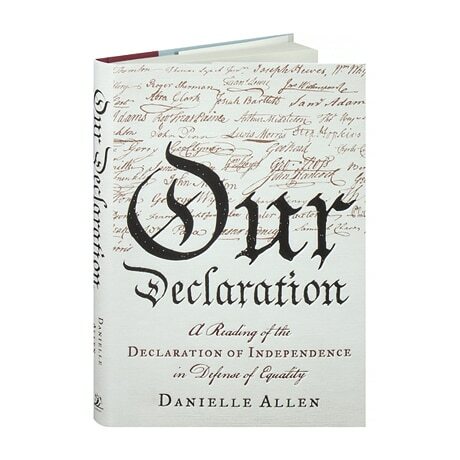 Though it is riddled with contradictions—liberating some while subjugating slaves and Native Americans—Allen and her students found that the Declaration makes a coherent and riveting argument about equality, a word all but forgotten as politicians and pundits trumpet for "freedom," yet just as essential to the stability of our nation. Vividly evoking the colonial world, Allen describes the challenges faced by John Adams, Thomas Jefferson, Benjamin Franklin, Roger Sherman, and Robert Livingston, the "Committee of Five" who had to write a document that reflected the aspirations of a restive population and forge an unprecedented social contract. Although the focus is usually on Jefferson, Allen restores credit not only to John Adams and Richard Henry Lee but also to clerk Timothy Matlack and printer Mary Katherine Goddard. The Declaration's list of self-evident truths does not end, as so many think, with our individual right to the "pursuit of happiness" but with the collective right of the people to reform government so that it will "effect their Safety and Happiness." That sentence leads us from the individual to the community, argues Allen—from our individual rights to what we can achieve only together, as a community constituted by bonds of equality. Challenging so much of our conventional political wisdom, the book boldly makes the case that we cannot have freedom as individuals without equality among us as a people.